He's my first Boa, and I have no problems with him- he nails any food item that enters his cage. I have him in a 10 gallon critter cage (with foil over most of the screen top) for now until I get his AP home ordered. I "insulated" this enclosure with 1/4" black foamboard on three sides after this pic was taken. My question/concern is that he hangs out in the open in his hot spot (90°, heat lamp and UTH on t-stat) nonstop. I thought maybe he preferred more heat so I bumped it up a few degrees for a bit... he stayed in place, and I'm back down to 90°. The ambient in the tank is 80, humidity is in the mid 60s. Care sheets online are all over the place, with recommended hot spots ranging from 85° to 100°. He acts fine. He eats aggressively, poops, and is very responsive- he just shows zero interest in exploring or moving from where he is since about day two in his home. Thoughts? I don't think there's a "problem" here really, just looking for thoughts or observations about this from people with more boa experience than me! Last edited by JTC; 01-02-2019 at 09:42 AM. Boas will hang out where they are comfortable. Also if you fed yours recently he may be digesting, so he'd want to be warm. Temps should be 78*F to 88*F.
Also how are you measuring temps? A heat gun or IR thermometer is typically best, as you can get surface temps or even the snake's direct temperature very easily. Thanks for the response! I have a dual humidity/temp gauge for a general idea/at-a-glance indication, but I use a temp gun a few times a day to get an exact feel for the temps throughout the cage. I'm happy he likes to be out where I can see him, it's just quite a bit different than my BP! Very nice boa. Congrats on the handsome new addition. I agree with bcr. As long as he has a good thermal gradient he'll go where he feels most comfortable. My boas will hang out on their warm sides for days or weeks sometimes and then go to their cool sides for a few days. It's all perfectly normal. cool end of her tank. Always easy to feed too. I wouldn't go above 90* either, btw, and 88* is better yet. 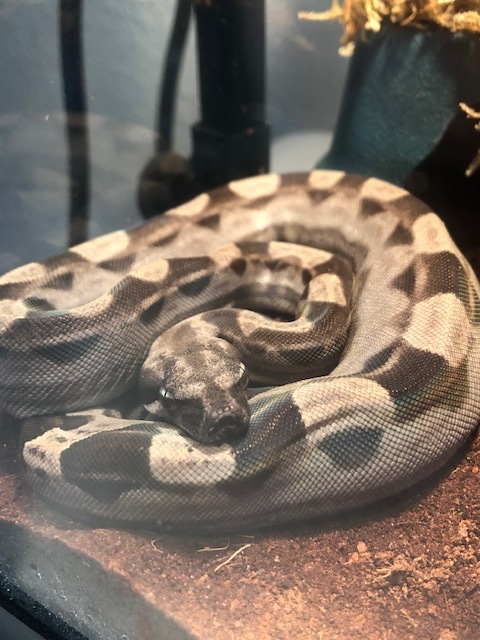 Most of my boas are on show most of the time too .it's great at least you get to see them ,just normally around shed time they will go in the hide. I love my motley too, there such a cool morph.very irridescent. I appreciate all the input, sounds like he's just being a boa! I'll tweak the hot spot down to 88° today as well!